All EzineArticle members now have total access to top-performing, data-driven article titles! With the successful adoption of our Article Title Writing Service (or simply Title Suggestions) by both Premium Members and Platinum level members alike, we decided it was time to make this powerful tool available to every EzineArticles member. So effective immediately, Title Suggestions are now available to all Basic and Basic+ Members as well. The Article Title Writing Service automatically creates a pool of (5) article title suggestions that are designed to be highly effective in each author’s individual niche. The author has a week to either use or reject any of these titles for one of their articles. Once those (5) stock title suggestions have been exhausted, you can choose another pool of (5). Title Suggestions Are Protected – 1) If you are submitting a new article and you happen to use a title that’s in our Title Writer System, you’ll get a notification that this title already exists in our system. 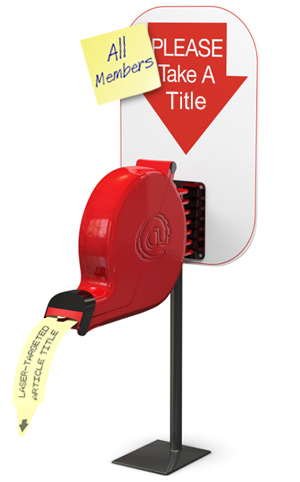 It will be removed from the title inventory and you’ll be allowed to use it, or 2) If you are submitting an article title that has already been assigned to another author through our Title Writer System, you will get an error message and need to change the title in order to submit the article. Use ‘Em or Lose ‘Em – Title suggestions not used or returned within 7 days of receipt will be automatically returned for the use of other authors. No replacement title suggestions will be issued. How to Get There – To get YOUR laser-targeted article title suggestions, log in to the EzineArticles Member Interface, click on the Author Tools drop-down menu and select Title Suggestions from the menu list. The best thing you can do for your article marketing success is to go check out this new feature today. The title suggestions you’ll receive have been culled from mountains of user data to make them extremely effective in gaining readership and helping you achieve more traffic back to your website or blog. Leave a comment below to let us know what we can do to improve this already powerful feature. This is great and I can’t wait to use my a title suggestion for my next article. thanks EzineArticles for this great tool. I can say that this is a fantastic feature. Sometimes the ideas run out, but excellent inspiration on a lot of themes. They don’t all do that well, but it is good when one does! Great Concept. I have Platinum status so all my articles get flagged. Giving recognition to people, is one of the greatest rewards you can give out. For years I ran a weekly car show. Out of a box, at different intervals, I randomly picked an owner/car. The owner got a $2.00 certificate, and moved the car in the front of the DJ. Suddenly, visitors flocked to see this “proud of a Peacock” car & owner. Thanks for the motivation. This looks like a good tool. This is good news for all of us. Article title are not too easy. Thanks to EzineArticles for this innovation. Thank you, This incredible motivation for members of the EzineArticles. It is a very nice and helpful gesture and all basic level writers will find it extremely useful! I’m loving this! I’m glad you had a blog post about it, because I didn’t realize the titles were there. I’m having so much fun writing about them. It’s neat to see what comes up! Thanks for this feature! Reviewing your titles has even given me ideas for articles to use on my blog and website. Still having issues with the Titles not refreshing. Sometimes when I use an article title and hit Submit, the title will be removed from “Title Suggestions”. But other times it doesn’t so the title just sits there even though I’ve actually used it. This will happen if a pre-written title is changed by you. Any pre-written title cannot be changed. The field will now be grayed out so no changes can be made which will prevent this from happening again. If you have further questions on this, we can address it via our member support team. Thanks for this feature, looks like a good tool. I can hardly wait to begin using this tool. Awesome and thank you for providing this feature. Great tool. Sometimes it is difficult to come up with a really good title that will catch someone’s eye. Thanks for this – have really realized how important titles are in successful article marketing. Recently read an argument however that the resource box is actually the key – not sure about this do you agree? Both the title and the Resource Box are vitally important to the success of your article marketing efforts. The title is what draws in the reader and gets them to read the article in the first place. Then, if you’re article is a good one, the reader will seek further information in your Resource Box and hopefully click on a link to your site’s landing page. If you’ve done your job right, your landing page will then convert that prospect into a customer. Thanks for making this resource available to us. I am going to make the best use of it as I know that the first contact readers have with articles are the titles. I am always struggling to come up with good traffic pulling titles and now I have the tool to help me in that area I can concentrate more on producing the quality content to go with the title. This is wonderful. I have used it and it is just great. With 20 some choices for my word choices I not only had a great title for my first article using this tool, I now have several more suggestions for articles and blog posts. This is a fabulous idea. If I see a title already written, it prompts me to write about the topic and research for the purpose of great content. Sometimes you can get so burnt out on keyword research and figuring out how to write your titles that you get hung up when it’s time to write the content. I see why Demand Studio’s eHow uses this method often. Unfortunately for me, I’ve been using titles at the high end of the keyword wheel which of course carries with it a lot of competition. With this new tool I’ll be able to position myself somewhere in the middle, which should also target my potential readers/clients a little bit better. Thanks for the article title tool and article writing tips, it’s very helpful. Wow, it’s really cool that basic members now also get access to this tool, thanx a lot! Thank you very much for this article,it was helpful. I like this tool, it will help me a lot when writing keywords.